In the previous article, I have explained how to implement Multi-values autocomplete textbox using jQuery AutoComplete Widget. Today I will show you how to implement autocomplete text box with an image using jQuery AutoComplete Widget. The Autocomplete textbox widget is one of the most popular jQuery UI widget, which is used for provides suggestions while user type into the input field (textbox). You noticed how the related suggestions highlight when we start typing in the Google search box, this is called autocomplete. There are many examples out there demonstrating how to implement autocomplete textbox, but most of them are using Ajax autocomplete extender control and web service, which can make it complex especially to beginners. Today I will show you, how to implementing autocomplete text box with an image in ASP.NET without using Webservice & AJAX autocompletes extender control. 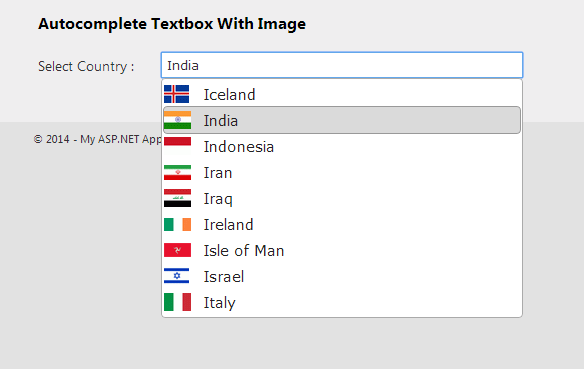 Autocomplete textbox with the image. Step-5: Add a Webpage and Design for implementing Autocomplete textbox with an image. Step-6: Write function for fetch data from database and show in Autocomplete TextBox with image . Write this function into your page behind.